The transition into the first couple days of classes after a long summer is hard enough — but for UC service workers covered by the American Federation of Service, Care and Municipal Employees (AFSCME) Local 3299, this means returning to unprotected jobs they have been performing for more than a year. AFSCME Local 3299 held a demonstration of about 40 people at Kerr Hall on Sept. 28. 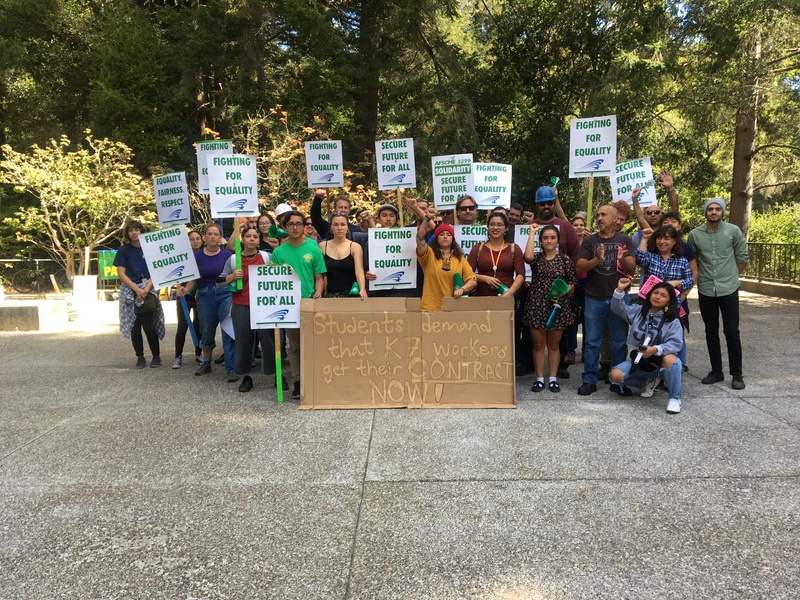 The protesters, ranging from union-represented workers to student allies, united to emphasize AFSCME’s ongoing struggle with the university to establish a new contract and shed light on allegations against the UC of federal labor law violation. Though negotiations between the AFSCME service worker branch and the UC have remained at a standstill since the statewide union strike in May, the UC recently announced contract terms for the Patient Care Technical (EX) unit of 3299. According to the vice president of the EX unit Monica De Leon, the UC is subverting the collective bargaining process by creating a pseudo-contract without receiving input from the workers. Nicolas Gutierrez, a 23-year AFSCME member and local organizer in Santa Cruz, spoke about the bargaining process and the difficulties workers have endured during the lapse in contract. “The UC is wasting taxpayers’ money to fight their own workers instead of settling a contract. How fair is that?” said Gutierrez at the rally, referring to the expensive, ongoing legal expenditures of the process. Speakers also took time to acknowledge the members of WSSC, who represented the students aligned with the AFSCME member’s cause, at the rally. Gutierrez said the role of student support in the movement is critical, as their condition is inextricable from the plight of workers. Beyond contract negotiations, the conflict between the UC and AFSCME extends to legal grounds. The union has recently posed allegations against the UC for violating two new California labor laws — AB 119 and SB 866 — by withholding union-represented employee contact information and distributing mass communications to employees after the Janus v. AFSCME Supreme Court case this past June. The Janus decision overturned a 40-year-old precedent that all workers represented by a union must contribute dues, regardless of whether or not they are formal members, to be used for collective bargaining. This will likely take a toll on union budgets and, in turn, the capacity of unions to effectively represent their employees during negotiations. John de los Angeles, communications director for AFSCME 3299, explained the implications of the university’s labor transgressions in the wake of the Janus case. “When you consider what is a nationwide assault on labor unions and, by extension, worker rights, what we see the UC’s most recent violations as is the university aligning themselves with the Trump agenda,” he said. The university disputes the allegations, according to UC media relations specialist Danielle Smith, and will address them in a proper forum. No date for the forum has been established yet. The EX unit will vote on Oct. 9 and 10 on whether or not to hold another strike to protest the stagnation of bargaining, with service workers also voting to strike in solidarity. Nicolas Gutierrez said it is likely to pass because the situation is dire. “We have everything to lose,” he said in his speech at the demonstration.